My latest Forgotten Postcard is for those of you who have been asking why I have no digital art work representing Canada. As a Canadian, it’s a valid question. Although we visit home once a year, the vast majority of that time is spent with family and friends and I often set work aside, including my camera. This summer, however, while visiting my parents in my home province of New Brunswick, we took a day trip to the beautiful island of Grand Manan. I took this photograph of Swallowtail Lighthouse from the ferry as we arrived on the island. As it has all of the elements I miss from the East Coast of Canada: rocky coastline, the ocean, lighthouses, I thought it deserved to be commemorated in a work of art that represents home to me. If you like this piece, don’t forget to check out the rest of my Forgotten Postcards Series. 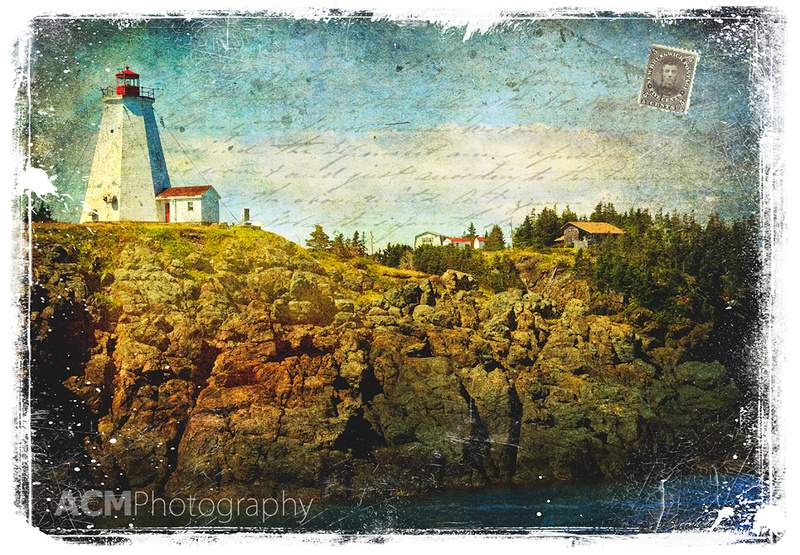 This entry was posted on Friday, October 15th, 2010 at 12:34 and is filed under Digital Art, Forgotten Postcards and tagged with canada, collage, digital art, east coast, Forgotten Postcard, grand manan, island, landscape, lighthouse, new brunswick, ocean, photography. You can follow any responses to this entry through the RSS 2.0 feed.